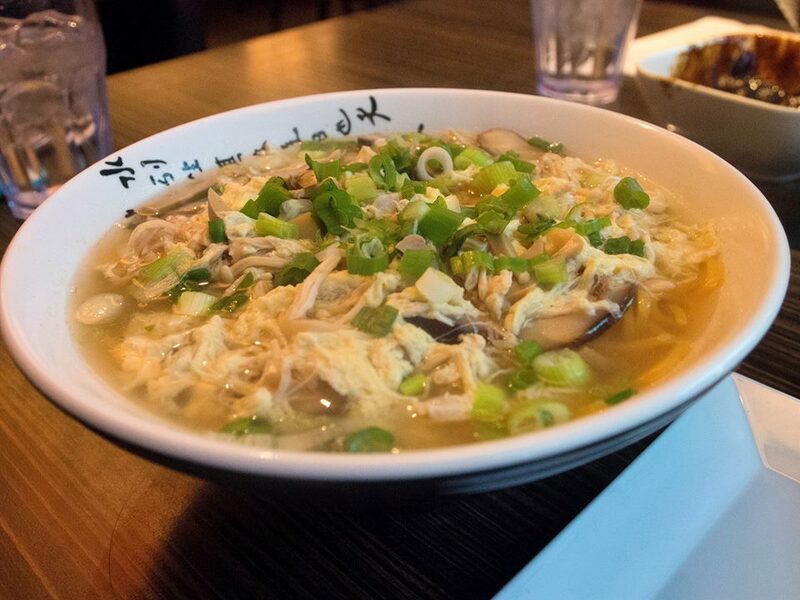 This popular restaurant in the heart of NYC’s Korea Town features many Chinese and Korean fusion dishes. That is why you might be confused with all the red in their decor, hey — are they Chinese or Korean? Doesn’t matter! 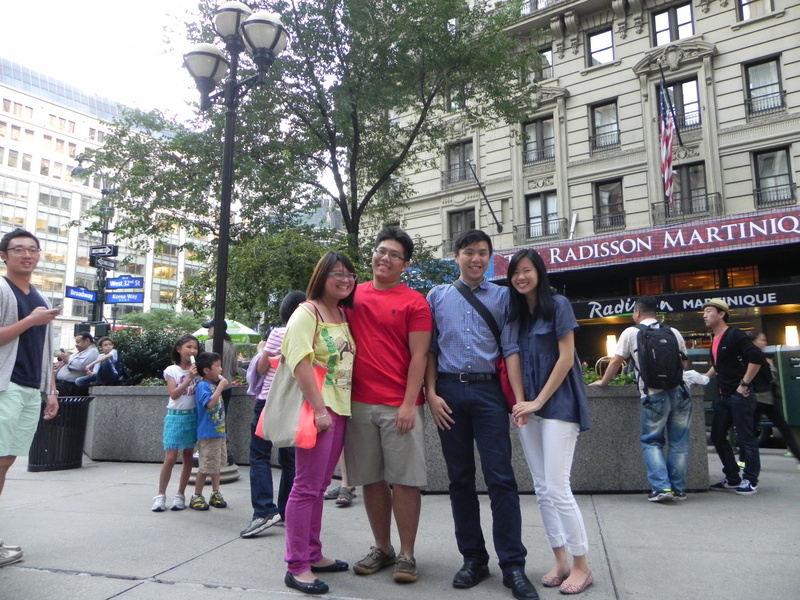 Just enjoy the combination of delicious food from different cultures that come together in this place. Might be pretty pricey for dinner, but you may be paying more for their fancier menus, service, and decor. For lunch, this place is pretty affordable with a dollar off regular prices and with the same serving size (or might even be more?) than the dinner serving size of the dish. Either way, you always leave full and satisfied! Here is the menu. Not sure if you all know the story, but in Korea they have something called “Singles Day” or “Black Day” (for the sauce) where they eat Jajangmyeon by themselves in a restaurant. And of course if you’re eating it by yourself, there might be someone else in the restaurant eating by himself or herself too. Then…what happens? Match-made in heaven lol. I used to eat this a lot more..when I was single =P But lo and behold, I did not meet Victor over a romantic evening of Jajangmyeon…bummer. Anyway, there is really something different about their noodles here — thicker? So it catches more of the sauce as you slurp it? Perhaps…or maybe it’s their perfectly cooked pork bits that remind you of the crispy American bacon? Not really sure, but I do know that this stuff is ADDICTING. I would dream about this bowl of heaven, no joke. 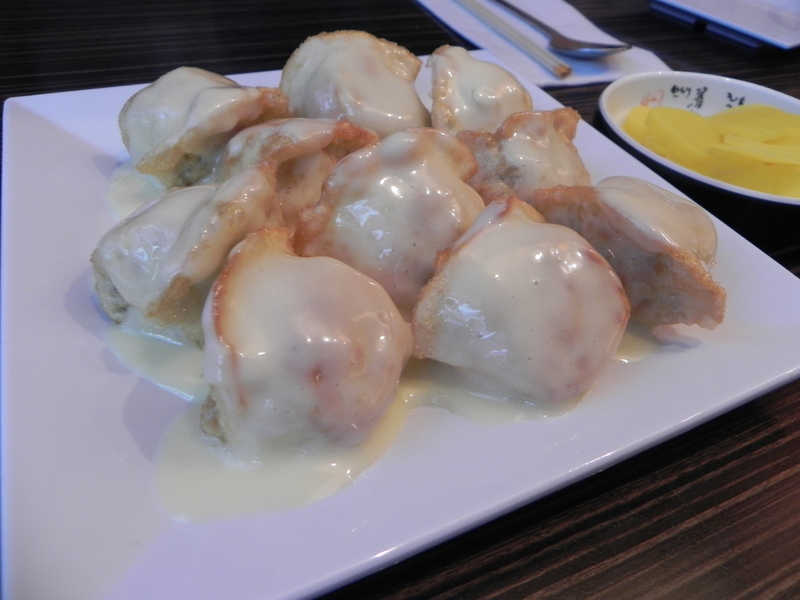 Our friend ordered an appetizer (I haven’t tried an appetizer here in a long time), the lemon cream dumplings. 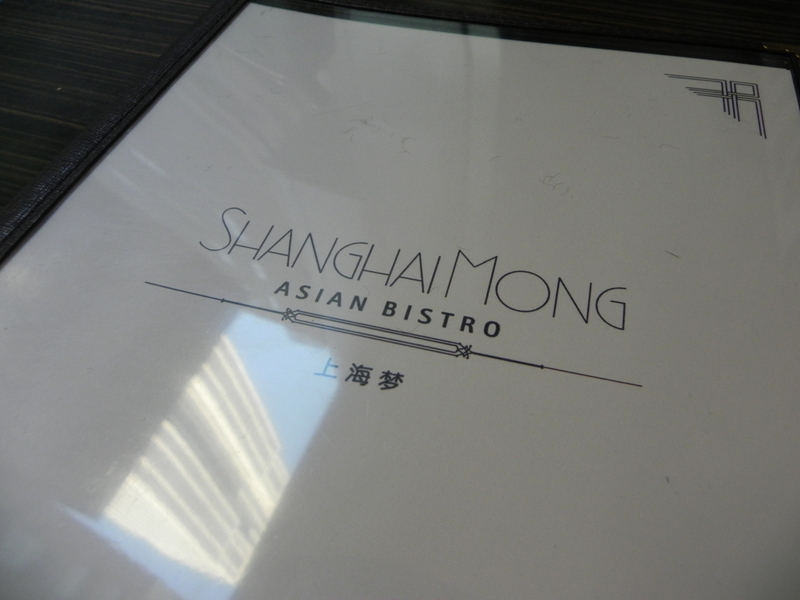 It was a pleasant experience to have a sweet dessert-like dumpling, but after a while it got soggy. I don’t think I would order it again…Be sure to eat those as soon as the plate hits your table, our you’re just going to eat a big mushy sweet and salty blob. Also, if you eat seafood (I sometimes eat it when I think it’s worth having a mild allergic reaction to) you should try the also delicious 1/2 seafood Jjamppong (a seafood spicy noodle stew) and 1/2 Jajangmyun dish. 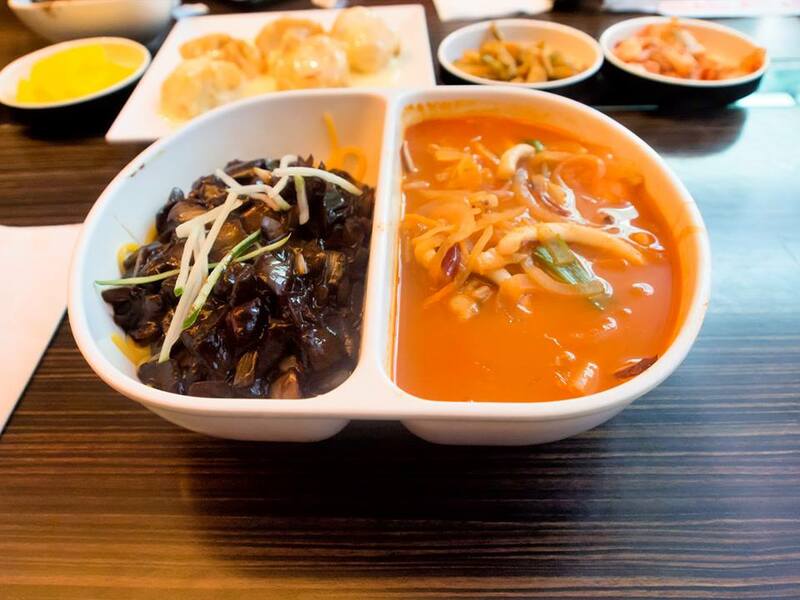 Get two dishes for the price of one! 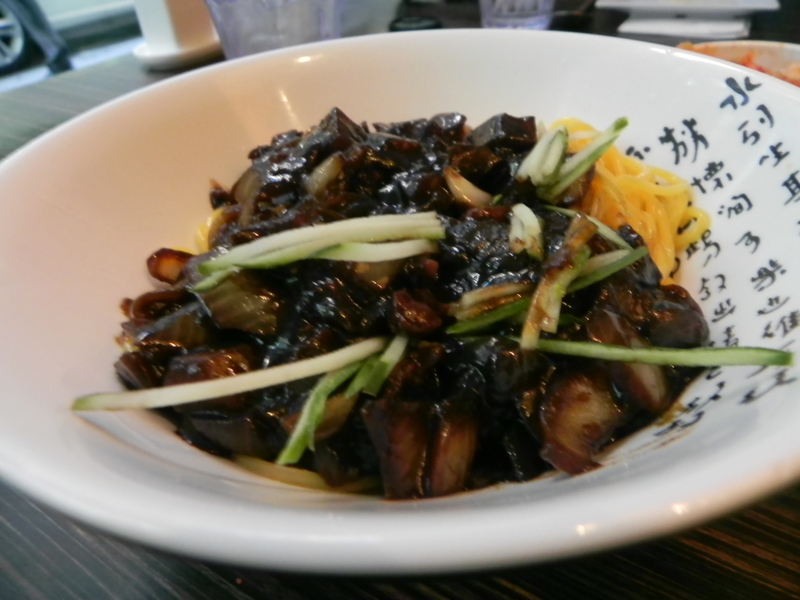 Jajangmyun is good. I like it, but not as much as Pinky does. This was my first time here. This place does make the best Jajangmyun I tried so far, so you should check it out. I ordered the spicier version and it’s a dollar more than the normal one. To me, it wasn’t that spicy, but it still has a little kick to it. The chunks of meat are pretty big compared to other places I have been. I guess it’s pretty good. However, I really really liked the appetizer. I have a knack for trying strange and unique things (except for seafood related things). Lemon Cream Dumpling? Now thats just genius. Like Pinky said… it’s a sorta like a dessert and it should savored right away. Its just that they served the food really fast the day we went and got our meal like 3 minutes after we got the dumplings. It has a unique flavor and I really enjoyed it. Very sweet and savory. Our new friend, Vicki ordered the Chicken Noodle Soup and was shocked by the massive portion of it. She did find a piece of hair in it though…the forever mystery of whose hair is it? 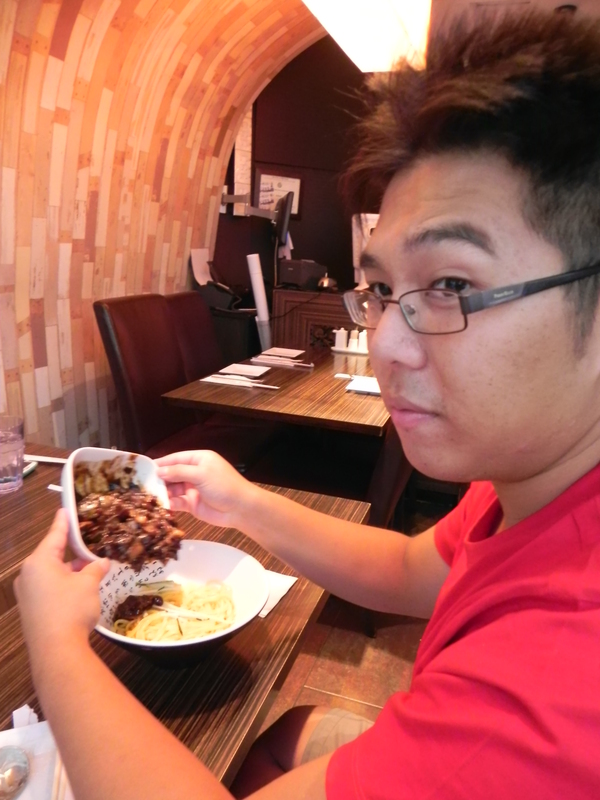 Dave ordered the 1/2 jjampong and 1/2 jajangmyun and said that the seafood part was spicy! He also thought it was pretty filling. Thanks for the treat, Dave! 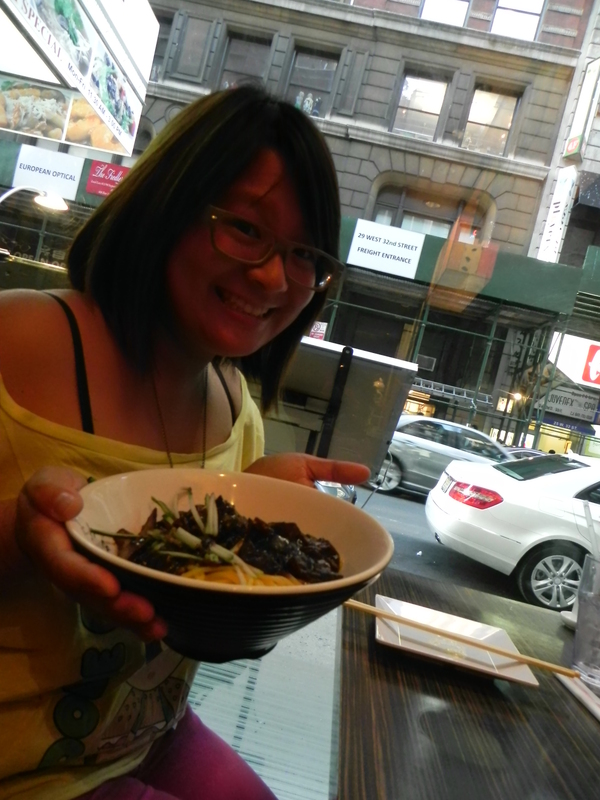 Posted on August 22, 2013 August 23, 2013 by pinkytwinkieeePosted in manhattan, New YorkTagged asian, black bean, black day, chinese, couples, cream, delicious, dumplings, food, fusion, jajangmyun, k-town, korean, koreatown, lemon, noodles, nyc, pork, seafood, shanghai, singles, tourist. Next Next post: Guessing game!